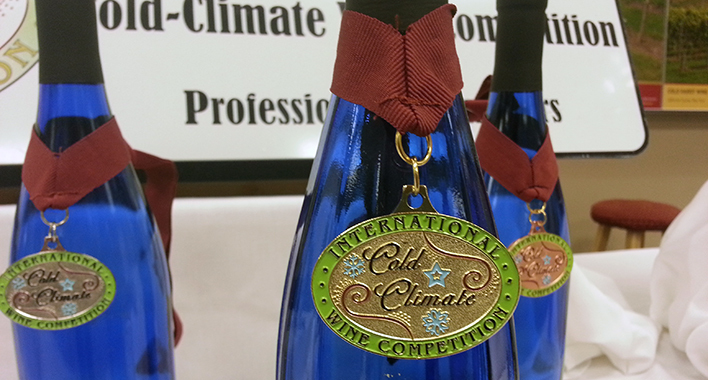 The International Cold Climate Wine Competition yesterday celebrated its 10th year of honoring the finest examples of cold-climate wine in North America. The judging was held at the Minnesota Landscape Arboretum, and The Growler was among 24 judges charging through hundreds of wines made with grapes that can withstand our extreme climate, several varieties of which were originally engineered at the University of Minnesota. Here are some tasting notes on a few of the standout winners from Minnesota wineries. For the second year in a row, the Governor’s Cup for best Minnesota wine in the competition went to this luscious white from Northern Hollow. It begins semi-sweet with ripe peach and quince notes, but the sip is quickly bolstered by mouthwatering acidity. Downright fun to drink. This one’s a crowd-pleaser. Tons of melon fruit in an easy-going, off-dry sip. Carlos Creek won Winery of the Year at the competition, for most cumulative medals, and their White Marquette also snagged Best In Show Rosé. The operation that’s become better known for Loon Juice Cider still has some great things going with grapes. This Marquette blend has a lovely balance of brambly black fruit and leathery tannin in a medium-bodied sip. Similar in style to the Northern Hollow La Crescent, this one shows beautiful fruit, with powerful pear aromas and fine structure to a pointed finish. A joy to drink. We’ve long enjoyed the wines from Chankaska, and this white blend of Frontenac Blanc and Frontenac Gris was among the best in the dry white wine category. Soft and fleshy green fruit with a crisp and direct finish. I’m awarding “Oddball Wine of the Competition” to this sip from North Folk, made primarily using a lowly blending grape called Sabrevois. Here, the variety shines thanks to a portion of cabernet sauvignon in the blend, bringing out notes of black olive, rosemary, and scorched earth, like a South African cabernet. To learn more about these wineries and the rest of Minnesota’s winemakers, explore The Growler’s Land of 10,000 Drinks Map.